Sara Barker, metamorphosis of friends disappeared subtle structures, 2016. Aluminium sheet, steel rod & bar, perspex, brass rod, automotive paint. Courtesy the artist; Mary Mary, Glasgow; carlier | gebauer, Berlin; The Approach, London. Photo: Max Slaven. 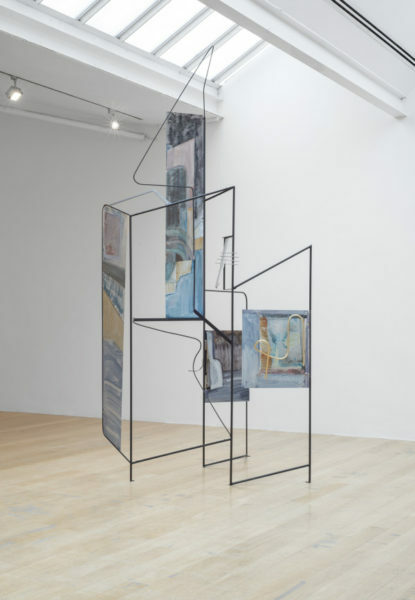 Sara Barker, Minerva made a dream to order Patterns she saw as signs, 2015 Stainless steel, brass rod, folded aluminium sheet, glass, perspex, automative paint, spray paint. Courtesy the artist; The Approach, London. Photo: Ruth Clark. This summer I was lucky enough to see Sara Barker’s exhibition at the Fruitmarket Gallery with director Fiona Bradley. As we moved from one piece to the next we marvelled at the ferment of inventiveness the work demonstrated – the palpable sense of an artist exploring more and more confidently the terrain she has designated her own. That terrain lies equidistantly between painting and sculpture, trading in frames and thresholds, extending out in to space with media as various as paint on canvas, on metal, copper wire, mirror and glass. Born in Manchester, and raised on the Isle of Man, Barker has been resident for many years now in Glasgow. Her pallet incorporates the blues and greys of the English seas as well as colours more redolent of summer fields. There is a lyricism to the work, in tandem with a concern with abstract form that is very Glasgow. Connections to the natural world are multiple – as we toured the show in Edinburgh Fiona Bradley pointed out figurative passages showing figures in the landscape in large scale new pieces that were incredibly surprising in relation to the older work. 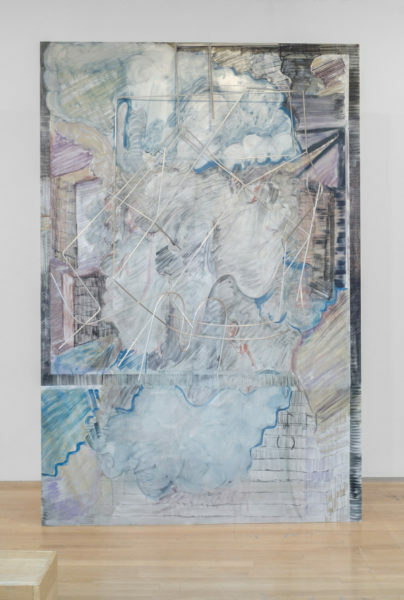 And in recent years Barker has started to make work intended to be sited in the outdoors, with painted panels that seem to reference fields and sky, and panels of mirror that bring the real landscape into the composition. Here in Birmingham Barker yet again surprises with new strategies. 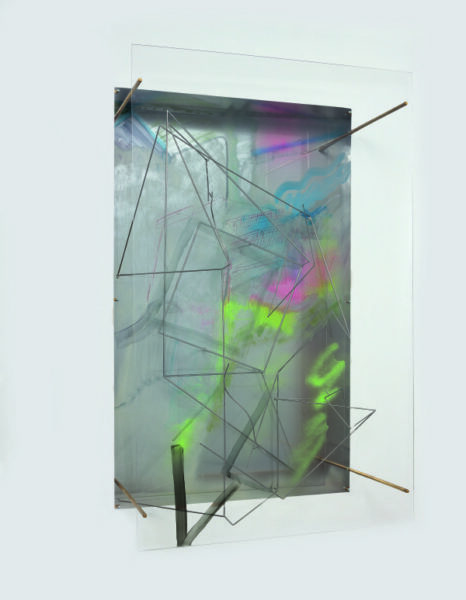 In the first space on the 2nd floor are two works that deploy multiple picture planes, Perspex panels washed with veils of milky colour and neon squiggles. 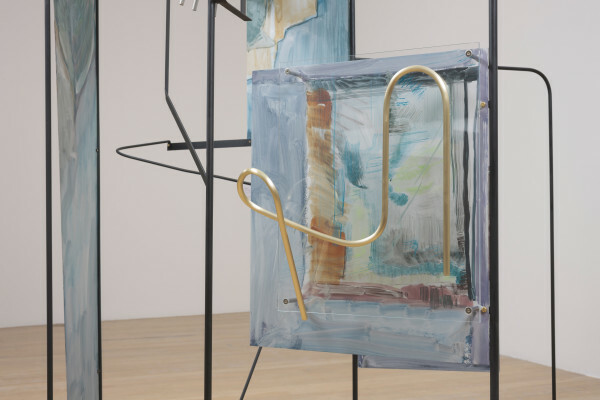 These works move out from recessed vitrines, each transparent panel connected by brass rods that arc and zigzag until they reach out towards the viewer. The titles show the way language is also an activating element of the works: geographies of Dust and Air moving parts out of night, 2015 is more like a haiku than a description of the work. The show includes earlier works – the delicate linear sculptural pieces that corral space with infinite discretion, pastel washes breaking up the slender flat planes. A powerful group of works from this year rejoices in titles such as Competition of Stones or soil knotted like toppled alphabets. These again consist of multiple painted and mirrored panels that overlap and intersect, the voids in between them dynamically part of the overall composition. It is when you move around the works that they fully reveal themselves. Between the panels and the wall, seething tangles of brass or aluminium rods seem to spring out like pure energy. In the largest work in the show, the letters F & M are characters, 2016 is a magnificent, complex piece that seems to crackle with electricity. Forms in aluminium rods project front and back of the freestanding work, it is a painting that refuses to accept its condition but bursts out into the room like a sculpture. Sara Barker is an artist of such energy and invention – this show just makes me eager to see the next. Contemporary Art Society Consultancy has commissioned Sara Barker to create two artworks at Angel Court in London, read more here.